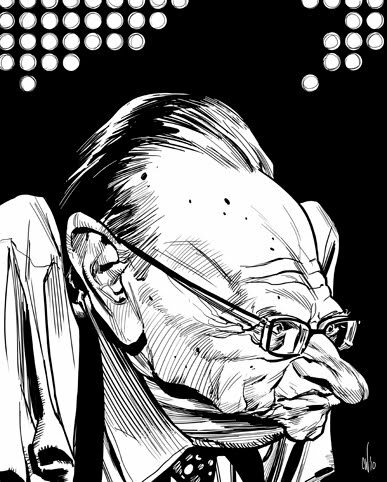 A quick digital caricature of the vulture-like, Larry King. This was done for the weekly challenge over at Wittygraphy. Great, man! This is the best Larry King I've seen. I loved it, specially the shoulders. Great! The attitude is very fantastic. Thank you. I love this blog. Hope you like it and leave your opinion!! Its nice to meet you! Everyone drew King from this ref pic but you did something new and very unique. Superbe ! Andres- Great blog. I'll be sure to leave a comment. Really great sketch Chris, love the Picasso also. Nicole- Everytime you post here I'm reminded I owe you a b/w drawing. I haven't forgotten! Ha! This is one of my faves of yours. Spot on.